Art meets technology in pioneering ways in a new facility opening Monday, Nov. 4, in the AXA Equitable Tower, located in downtown Syracuse on the Connective Corridor. Newhouse M.I.N.D. Lab is debuting its new world-class research and design center, featuring large-format new media technology and visualization space, augmented reality, 3D computer graphics and human computer interaction. SU Arts Engage is opening co-located new community performance space, combining physical expression, such as dance and theater, with the world of 3D projection and virtual reality—melding artistic and scientific visualization. The new facility launches with an open house, reception and demos on Nov. 4 from 5-7 p.m. in the first floor AXA lobby area. SU faculty, staff, students and alumni are welcome. Combining these two creative University offices into a single location on the Connective Corridor was coordinated by Syracuse University’s Office of Community Engagement and Economic Development. Together, they are Syracuse @ Downtown, extending the University’s commitment to connect faculty, student and community expertise to accelerate innovation, technology commercialization and civic entrepreneurship. The new research and design space was designed by the Newhouse Media, Interface and Network Design (M.I.N.D.) Lab, an international network of human computer interaction labs specializing in virtual environment design and media research. M.I.N.D. Lab worked in partnership with SU Arts Engage, a leading performing arts organization that fosters collaborations that inspire the community through diverse performance art. “This space is an interesting, dynamic and visually appealing focal point featuring visual and performance arts and visualization science,” says Frank Biocca, professor in the S.I. Newhouse School of Public Communications and director of the M.I.N.D. Lab. Biocca, who directs M.I.N.D. Lab’s network of collaborative research centers for scholarly work in communication, cognitive science and human-computer interaction, is also a World Class University Professor at Sunkyunkwan (Samsung) University in Seoul, South Korea. Biocca’s work focuses on how mind and media can be coupled to extend human cognition and enhance human performance. He has conducted research on the psychology of presence in virtual environments, spatial cognition and information organization in high-bandwidth and mobile system collaborative augmented reality systems, and adapting interfaces to cognitive styles and sub-cultural differences. The author of “Communication in the Age of Virtual Reality” and a former Silicon Valley entrepreneur, he holds patents on augmented reality technology and participated in the introduction of the first portable computer. The new M.I.N.D. Lab facility at AXA Tower was designed by Biocca and his team to support functions, such as large-format 3D rear projection, full multi-wall projection, multi-screen visualization tools, advanced graphics and virtual reality capability, along with advanced brain measurement systems. The facility is a unique combination of the arts, new media and scientific human-computer interaction, allowing for research that supports visual and performing arts with virtual environment tools. The SU Arts Engage space will be used for this interactive work, as well as community-accessible workshops, rehearsals and performances that afford the ability to capture full-body interaction within virtual environments using 3D game and visualization design. By collaborating with other art-affiliated organizations, SU Arts Engage helps commission world-renowned artists, whose work challenges mainstream culture, creating a local and global dialogue. “SU Arts Engage embodies the vision of Scholarship in Action by connecting the University with the community, while simultaneously creating a place for interaction through performance art,” adds Carole Brzozowski, University Performing Arts Presenter, who directs SU Arts Engage, which also shares an office with the Janklow Arts Leadership Program on the Connective Corridor on East Jefferson Street. The interplay of multifunction performance space in high-tech research and new media space makes this facility unique for supporting visualization design. Its open, experimental, multifunctional configuration gives it flexibility to converge physical, real-world activity with augmented computer-generated sensory input in semantic context. Research applications for this work are varied, from the military to industrial, medical, commercial and entertainment sectors. Technology pioneered through the M.I.N.D. 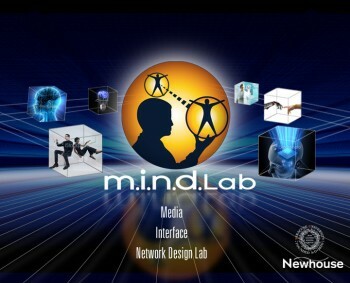 Lab network spans health communication, 3D interactive television, medical and scientific visualization, brain imaging and adaptive computing, new media design, augmented cognition and augmented reality design. M.I.N.D. Lab and its partners have collaborated with new tech startup companies, as well as Samsung, Nokia, 3M, General Motors, Siemens, AT&T and leading news organizations around the globe. The new facility complements programs at the adjacent Tech Garden. M.I.N.D Lab also gives the Syracuse technology community a global reach. The new Syracuse lab will be the lead facility in a network that includes four international core labs in the United States and Korea, and networked labs in five European countries: Netherlands, Spain, Portugal, Russia and Germany. The open house will also be supported by local and international M.I.N.D. Lab partners: Kongkuk University, Seoul; Lab Human, Valencia, Spain; Kaywon School of Art and Design, Seoul; and VisualTec, Syracuse.